Samsung Galaxy S5 the latest Flagship device from Samsung released on Feb 24th at the Unpacked event, Galaxy S5 has many amazing features like the Finger Print Scanner (seen in iPhone5s already), Heart Rate Monitor with the sensor embedded in the LED light and the Download Booster option which lets you download files which are “Over 30 MB ” in size faster as seen in the Options menu of the Samsung Galaxy s5. Galaxy s5 has some serious Performance upgrades compared to the S4 in terms of Processor which is a Snapdragon 801 Processor giving it some muscle to run applications smoothly and along with the powerful four Krait 400 cores and Adreno 330 GPU giving it considerable boost in performance, there are some good Options which Samsung has given like the Download Booster which the phoe itself shows will boost the Download Speeds for files which are “Over 30 MB” in size. At the top of the Screen beside the Download Booster Text you will find a Slider Option which can be clicked on or Slid to Switch the Download Booster ON or OFF. When you scroll down you can see an option to Show or Not show Speed info Pop ups by Download Manager. The Download Booster works on the Principal of Making Download of Files which are larger that 30 MB faster by combining the Download Speeds of Both your Network Internet and the WIFI connectivity. 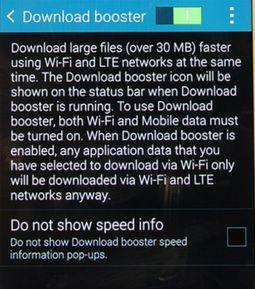 When you turn on Download Booster, any files which you select for Downlanding using WIFI larger than 30 MB will be downloaded by using both WIFI and 4G LTE (network internet connection). 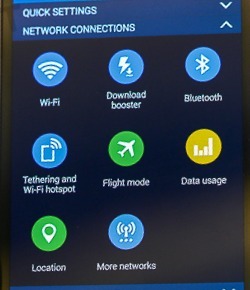 So if you want to use Download booster you need to make sure that your Galaxy s5 is connected to both 4G network and WIFI to help make downloads faster.